On the most recent Coffee Convos podcast, Teen Mom 2 star Kail Lowry and co-host Lindsie Chrisley tackled the controversial topic of whether or not children should be vaccinated. Lindsie reveals that she did have concerns about vaccines being linked to autism, but she and her husband Will still elected to have their son vaccinated. 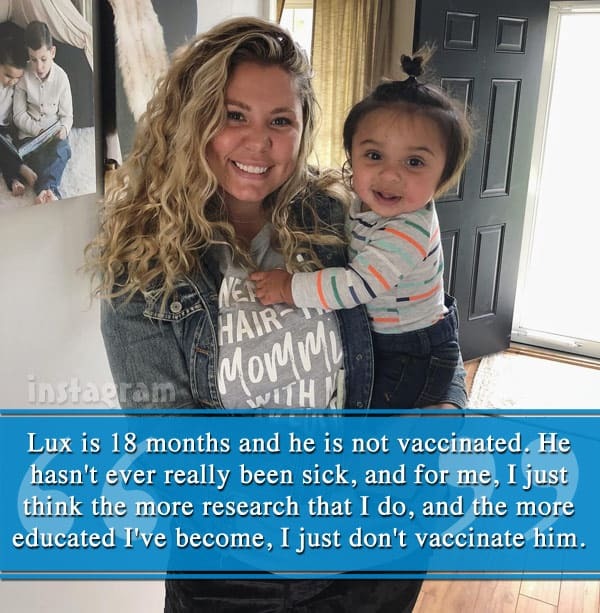 Kail, on the other hand, says that Isaac was vaccinated because she “didn’t know any better,” and Lincoln has only been partially vaccinated. Her youngest son, Lux, has received no vaccinations. 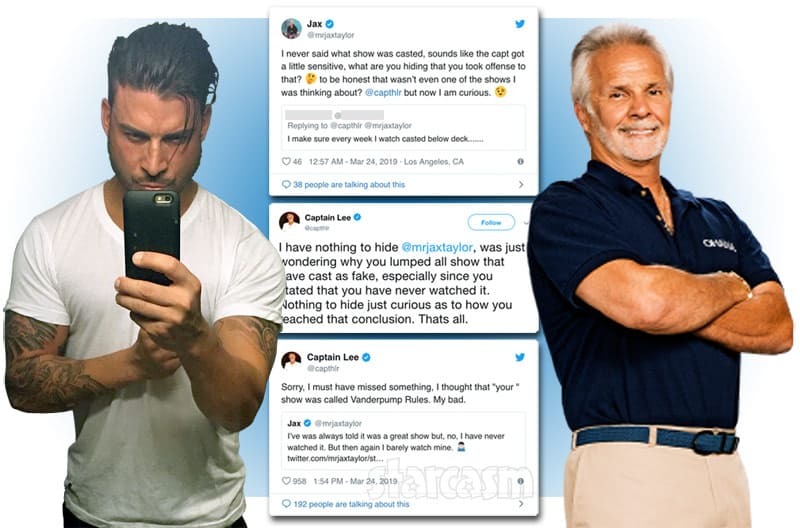 Wondering if you and Kail can talk about the well-known controversy of vaccines. I’m a mother of three and I’ve always said that I would never be “that mom,” but recently I’ve read so many horrifying stories about vaccines like the MMR [measles, mumps, and rubella], some absolutely devastating stories. I vaccinated my two older girls and never even thought twice about it, but now I’m paranoid to vaccinate my five-month baby boy. I would love to know both of your opinions. P.S. I frickin’ love you both, and always look forward to Coffee Convos. I definitely think this is a controversial topic, and I don’t want to lose listeners because of my opinion — but, I did vaccinate Isaac, because to me, I didn’t know any better, and I gave — I let them vaccinate him with whatever they basically said that he needed. And I feel like I was ignorant, and didn’t do research, and didn’t know any better. With Lincoln, I knew a little bit more, and I started to research more, and that’s when I think the conversations of vaccines started to really be going on with me and my friends that became moms. And there were documentaries on Netflix, and all kinds of, just, news that I would try to look into. Lincoln did not get all of his vaccines. I definitely picked and chose which ones I felt like were necessary, and he did not get them all at once. So, he did one or two vaccines at a time. And again, those were the ones that I felt that he needed. Lux is 18 months and he is not vaccinated. He hasn’t ever really been sick, and for me, I just think the more research that I do, and the more educated I’ve become, I just don’t vaccinate him. So, that’s my opinion, and I don’t judge Lindsey if she chooses to vaccinate, or anyone else who chooses to vaccinate — that’s your prerogative. You’re a parent, you know what’s best for your child, and I’m not here to judge. We did vaccinate, and we did it on an alternate schedule, so it wasn’t on the schedule that is the recommended schedule. And I did do some research before vaccinating, and what I found was that there have been links from the MMR vaccine to autism. And that definitely scared me a lot because I think autism is more prevalent in boys, so that really, really scared me. And I was, like, “OK, I need to talk to a pediatrician about this because this could not be good,” you know? “I need more information than what I’ve just found on the internet. I need, like, a professional opinion.” And to be perfectly honest, my pediatrician, and any of the other moms that I talked to in regards to vaccines, all pediatricians are 100% pro-vaccine, so you’re going to get, like, that one medical side. And you’ve got to consider, too, that it’s a business. It’s the sad reality of it, but it just is. So, after talking to my pediatrician, and telling him my concerns about the vaccines, I told him that I would like to split the MMR vaccine because that’s what I had read all over the internet — that if you’re going to vaccinate for it, to split up the vaccines. And, supposedly, in some articles it states that there is no link with autism and vaccines. I believe it’s very possible that there is. And they’re saying in some articles that it’s because of the combined vaccines, like the combination of them. So, I did it on an alternate schedule, and then spaced them out very far, and have had no issues. And I do do the flu shot. Personally, I can’t take the flu shot because I get sick every time. I took the flu shot one year, and I got the swine flu. 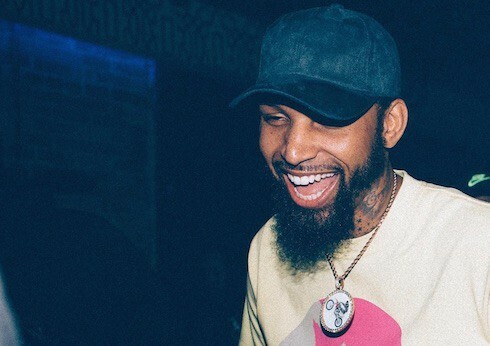 And then the next year I took it, I got two types of flu — I got Type A and Type B. So, I can’t take the flu shot. Will takes it and Jackson takes it, and — knock on wood — they have not had any issues. So, I really think that it’s good to educate yourself, read as much as you can, and don’t take other people’s opinions when it comes to your child, because you know what’s best for your kid. And that’s just — I’m going to leave it at that. Honestly though, just to piggy back off what you’re saying, too, it’s, like — I’m not saying be like me, but don’t shove your opinions down your friends who have kids’ throats. Like, nobody wants to hear it. That’s why I don’t preach about non-vaccination and anti-vax, I just don’t do it, and if people ask me about it, then I’ll have a conversation, but I’m not just gonna, like, go out there and, like, freak out about it and shove it down your throat. Don’t be that mom. If you — and also, if you don’t want your kid around my kid because he’s not vaccinated, that’s your prerogative, too. I’m not here to, you know, I don’t know, start a parenting argument about it. But, yeah, like Lindsey said, just do your research and come up with — I mean, if you have questions, I’m not a doctor, Lindsey’s not a doctor — but, do your research and talk to your pedia– my pediatrician has been so great. All three of my kids go to the same place, and they do not push vaccines. They ask me: ‘Do I want to vaccinate?’ and they don’t push it at all — which was surprising to me because I have a friend who his child is not allowed to go to…their pediatrician because his family chose not to vaccinate. So they won’t see him any more. 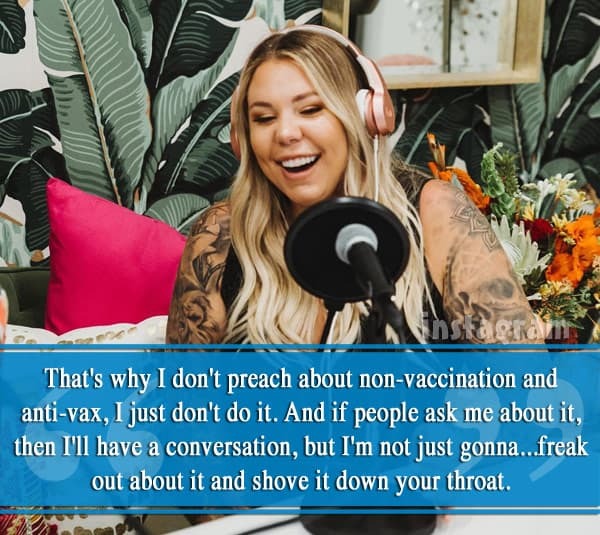 Of course, Kail seemed to be sending mixed signals in regards to her opinions on vaccinations during the filming of the Teen Mom 2 Season 8 Reunion. 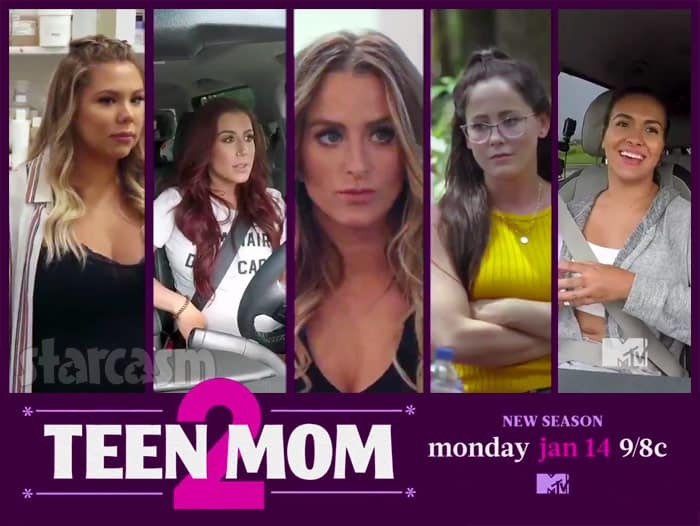 In the behind-the-scenes footage from that reunion featured in the early episodes of Season 9, Kail demanded to have a separate space from Jenelle and Briana due in part to the fact that Lux was not yet vaccinated. The anti-vaxxing movement has gained a lot of momentum over the past few years, and the World Health Organization recently listed “vaccine hesitancy” as one of their “Ten threats to global health in 2019.” The number of outbreaks of measles and similar diseases targeted by vaccines continue to rise in countries like the United States — including an instance this week in which the Portland, Oregon area saw 23 confirmed cases of the measles after an infected man reportedly attended an NBA game there. All of the information coming out about the role that pharmaceutical companies (and even a lot of doctors) played in creating the modern opioid epidemic can make someone suspicious of the “vaccination business” having its own agenda, but, in my opinion, there are just way too many doctors who take their Hippocratic oath damned seriously for the rate to be close to 100% pro-vaccination just because of some sort of monetary motivation. That’s just my opinion, though, and I’m certainly not going to shove it down Kail’s throat. 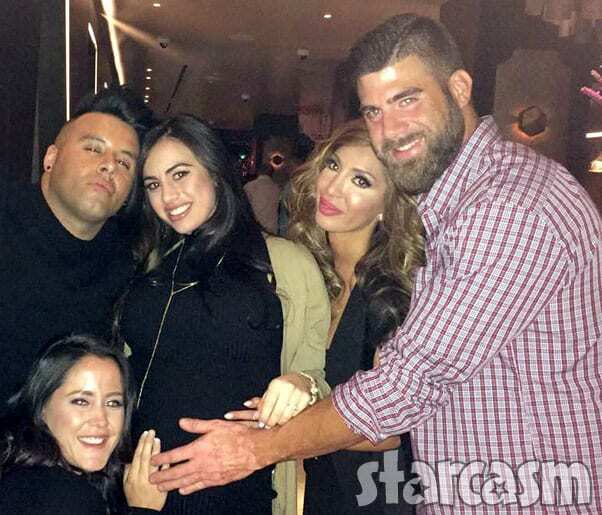 16 & Pregnant, Teen Mom 2’s Leah and Corey are married!